The Sikhism/Gurmat class is is held every Wednesday from 6:30pm to 7:30pm for children aged 3 and above, and is held in the main divan hall. The basic beliefs of Sikhism with focus on the teachings of the Sikh Gurus and provides opportunities to learn shabads from the Guru Granth Sahib Ji. The Sikh daily prayers – Jap Ji Sahib, Rehraas Sahib and Ardaas. Provide opportunties for the children to perform infront of the sanat of the Gurdwara. Occasionally, special Gurmat Camps are organized where children are divided into groups based on their age and spend all day at the Gurdwara attending workshops in Sikhism with some time set aside for other activities. 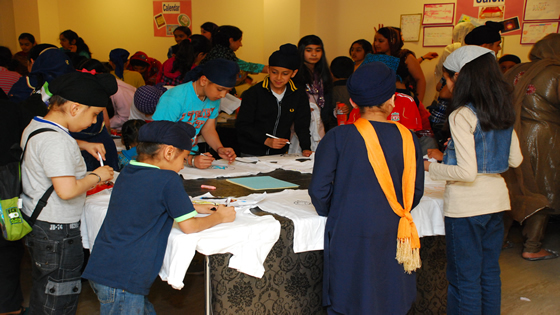 This is a wonderful opportunity to meet other children as well as learn more about Sikhism. Gurmat Camp May 2011 – click to view more pictures from this camp. There is no need to enrol for this class – to attend a class all you need do is come to the Gurdwara on a Wednesday and join in.